Joe And Mable Is In PRE-Launch !! The Internet's FIRST AUDIO comedy. Every now and again something COMPLETELY DIFFERENT appears on the Internet. This is one of those times. 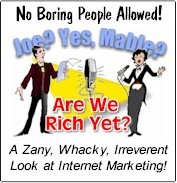 J&M is the Internet's first AUDIO comedy on Internet marketing. Each week you can listen to a new off-the-wall 5 minute webisode on the lunatic adventures of J&M. This soon-to-be-released weekly audio comedy - pre-launch starts on January 15th, 2004. Series launch is on March 1st, 2004 - follows the fractured path to wealth and fame of the two main characters, Joe and Mable... and a cast of whacky characters as they attempt to find that Holy Grail of Internet Marketing... Instant wealth. Joe is from Australia and Mable is from New York. The rest (well they may as well be from outer space for all the sense they make) are from some place called Oodnadatta. So, loosen up your funny bones... get loose, and make sure you've put down your coffee cup before you listen [because you'll be laughing so hard you'll probably hurt yourself]. and get your laughing gear ready for the Joe And Mable show. It's coming to a web site near you, SOON!